This rainbow was the first thing I saw when I woke up. Unfortunately, I didn't get my camera set up in time to capture an ultraviolet exposure. While I was shooting it, a park ranger told me that there is a solar array on one of the Chisos mountains that can reflect the sun in a very photogenic way around dawn. This didn't happen while I was there, but maybe someone reading this will have better luck. The movement of the rainbow relative to the landscape and camera in-between exposures causes an interesting effect in the statistical images, making those variations an example of "multitemporal" imagery (see TMSB Tutorial 4E: Multitemporal Processing). Unfortunately, I was not able to get a UV exposure quickly enough to capture the rainbow before it faded away. Another shot from within the Chisos Basin campground. Lens: Nikkor-Q 135mm f/3.5 or Nikkor-Q 200mm f/4 @ f/? Taken near the main visitors' center at Panther Junction. I returned to Boquillas Canyon to get at least one better shot in full daylight. The Rio Grande runs through the middle of the canyon, and the US/Mexico border runs through the middle of the river. Due to border paranoia, it is no longer legal to cross from one shore to the other. Taken near the southern intersection of the main park road and Old Ore Road. The distant rock wall in the upper-right section of the image is the same one that Boquillas Canyon runs through. Despite the high temperature, there was still water over the road between me and Santa Elena Canyon. There was no way to tell how deep the water was, but because I knew I wouldn't have another chance (at least for a long time), I decided to chance it, and discovered that it was actually shallow enough to drive through even in a sedan. I'd seen several other people turn back, so to prevent anyone else from making that mistake, I picked up a disused road cone and dropped it in the middle of the pool to give others a hint about the depth. Based on how difficult it can be to determine how deep a pool of water across the road can be, I thought it might be helpful if the Park Service were to plant depth markers when they form. Just something simple like a 2-meter pole with alternating black and white sections (each about 20cm long) would let visitors get a rough idea of if a pool were shallow enough to drive through or not. The canyon itself is visible in the distance in the upper-left section of the image. I highly recommend bringing wading boots (at least knee-high) when visiting the two major canyons. I didn't have any with me, and so I was only able to see parts of them (Santa Elena Canyon, in particular) from a distance. These photos only represent a small subset of Big Bend. For example, reaching numerous areas of the park requires driving an offroad vehicle over primitive dirt roads. There is a lot to see even without that, but I imagine visitors with one could easily spend five days there without seeing the same thing twice. The last area I visited during daylight was the Lost Mine Trail, which leads up to the top of part of the Chisos Mountains. This is a really great hike to go on (most other visitors recommend it as the one to pick if you only have time for one), but don't expect to see an actual mine anywhere on or near the trail. Apparently it's named after a legend about a mine whose location was kept secret by the people who ran it. Near the top, there are some brightly-coloured rocks that make me think there could be mineral deposits in the area (similar to the brilliant colours of the Grand Canyon of the Yellowstone River's canyon walls). There is at least one abandoned mine in the area (Mariscal Mine), but getting to it requires taking one of the primitive roads in a 4x4. On the way down, I spotted an enormous blue wasp with orange wings. I didn't take a picture - the wasp was so large that it eclipsed the sun and lighting was therefore not suitable - but here is a helpful identification chart for future visitors. 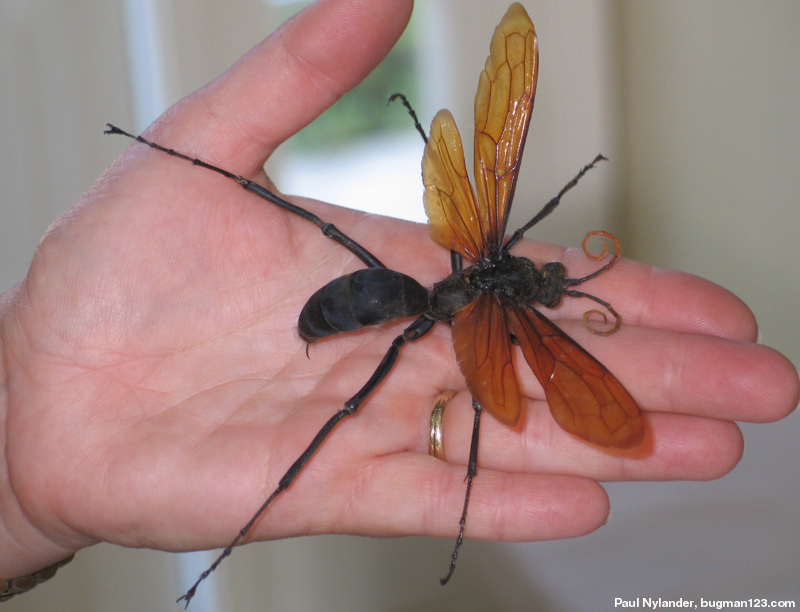 Apparently this type of wasp is actually called a "tarantula hawk" - and yes, they are big enough to prey on actual tarantulas. Paul Nylander has a particularly impressive photo of one. I didn't time my ascent, but my time back down the trail was about 75 minutes, carrying my camera gear. For my last picture of Big Bend, I chose the "Window" at sunset. This sight is a short walk away from the Chisos campground. 1. Based on the chart included with the Lightspeed and Hyperspeed PC games published by Microprose in the early 1990s.